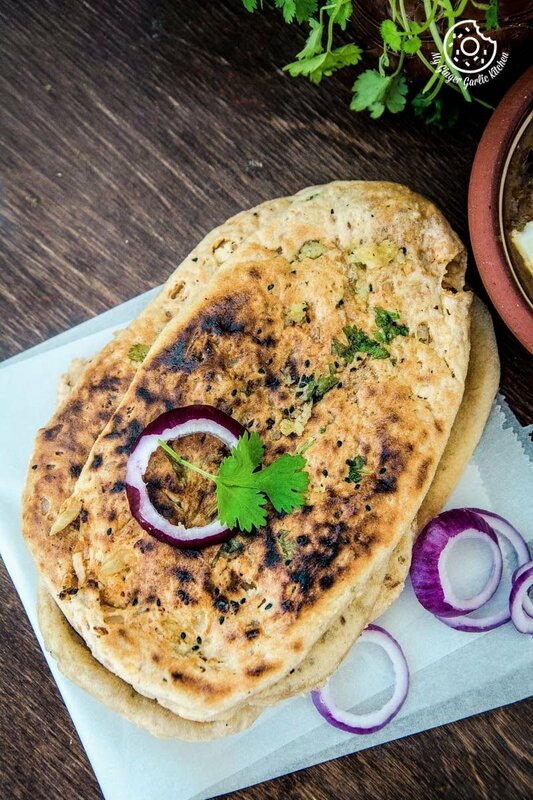 Indian Paneer Stuffed Naan — this crispy Indian Naan is stuffed with a classic and delectable mixture of Indian paneer, onions and some spices. It can be served as breakfast and also as a main meal. Some sunshine, some warmness, and some good food is my absolute definition of a Friday. I can rather say that this is exactly what I need to start a great Friday. Let’s talk about today’s recipe. Today, I have a really simple, comfy and delightful dish to share with you and I think you would love this one. Do you ever get that emotion about dishes which are very easy, and you love them so much, and want to have them at any time of the day? Well, I get the same feeling about this ‘Indian Paneer Stuffed Naan’. I love any type of naan. I love all types of paneer meals. It focuses on my two main favorites, so I just can’t resist it. I don’t necessarily need a curry for scooping these naans. I can make it a meal in itself and have it with some plain yogurt or even have it without anything. I can have them in any season on any day. They’re just SO GOOD. It’s buttery, spicy, and filled with some paneer — so this is one of my ultimate comfort foods. If you want to distract me, then you can offer me a paneer stuffed naan. Then I would easily be distracted, and this is a tried and tested method by little A. She always uses it as a weapon by offering me a pretend paneer stuffed naan which she makes in her toy kitchen. 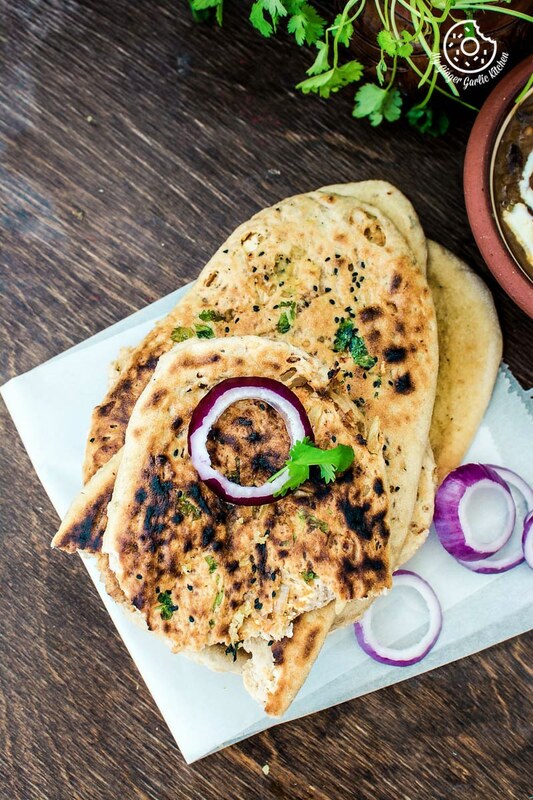 You can have this naan as a side bread, or you can even make it an entire meal. This can make a wonderful protein-rich breakfast meal for a meatless Monday or any other day of your choice. Whenever I have leftover naan dough I try to make stuff naans with them, paneer stuffing is my favorite. It’s kind of a perfect comfy food. Alright, so what makes this naan so good and so perfect? A good quality of fresh paneer (preferably homemade). Lots of onions and cilantro. 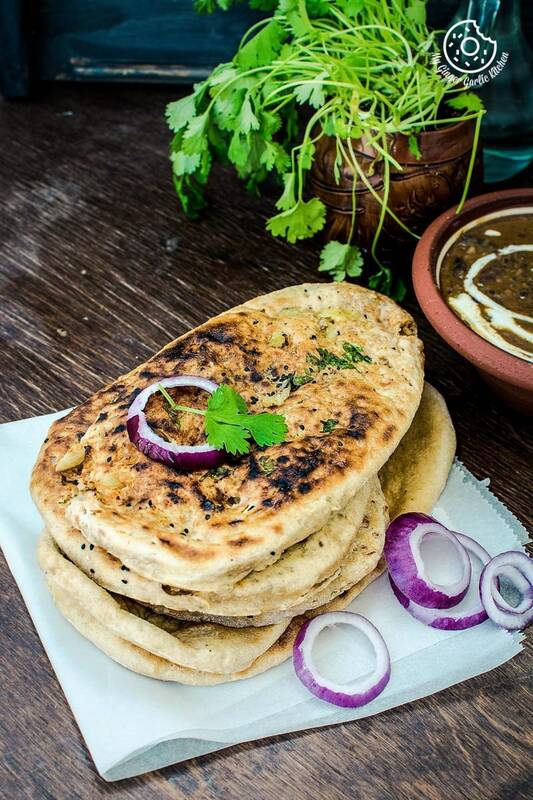 These are the two star ingredients which make this naan so sizzling and tempting. You can also add mint here. 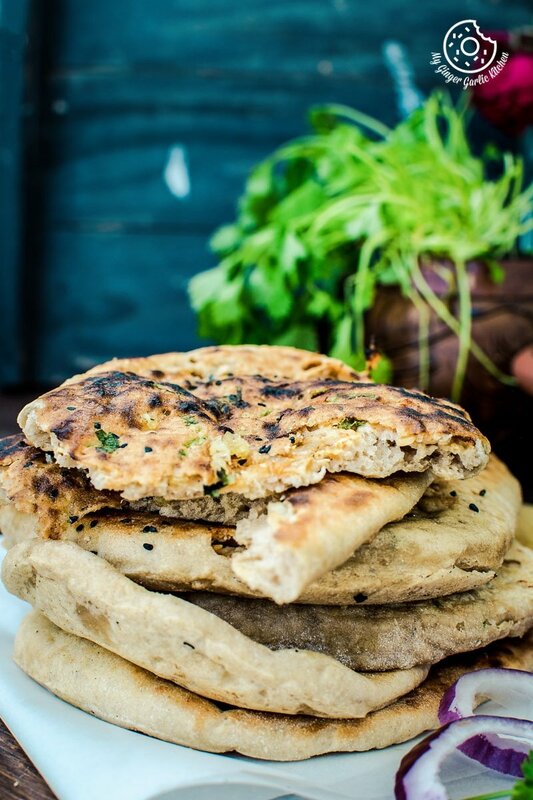 Some basic leftover or fresh naan dough works best for these stuffed naans. 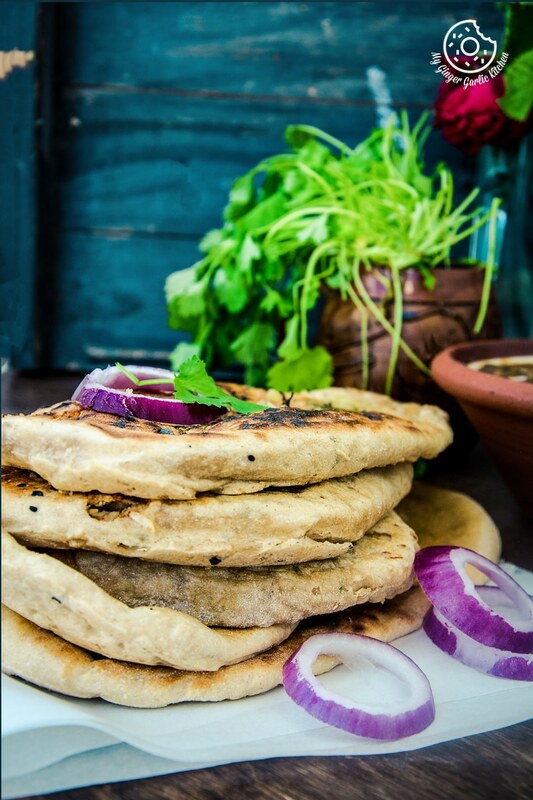 For me, a generous amount of butter or ghee on top of these impressive flatbreads is a must. As soon as I make this Paneer Naan, I top it with a dollop of butter. 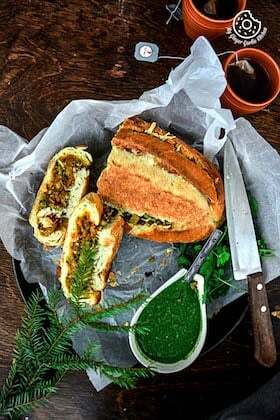 This is the best way to relish this mildly spicy naan. 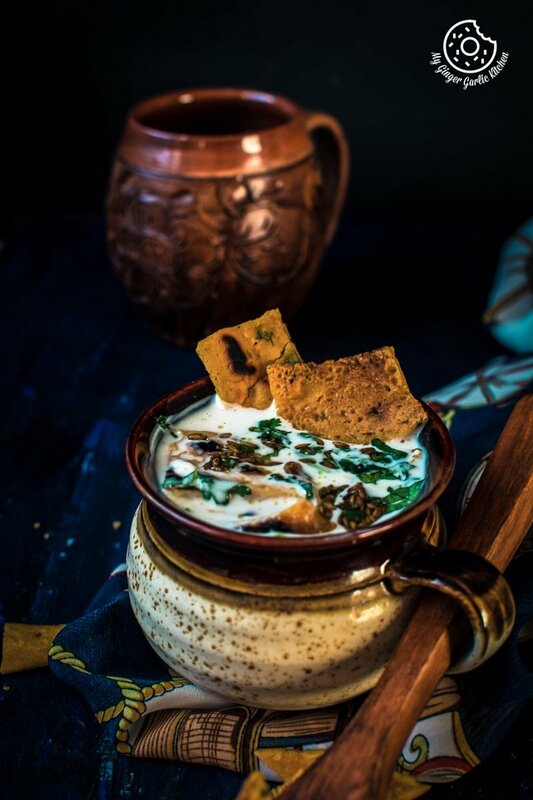 Serve it with any of your favorite curries, I personally like to serve it with dal makhani or Matar Paneer. And if you want a lighter meal, then simply serve it with some raita and pickle. Make it as a side for guests and I am sure that everyone will love it. 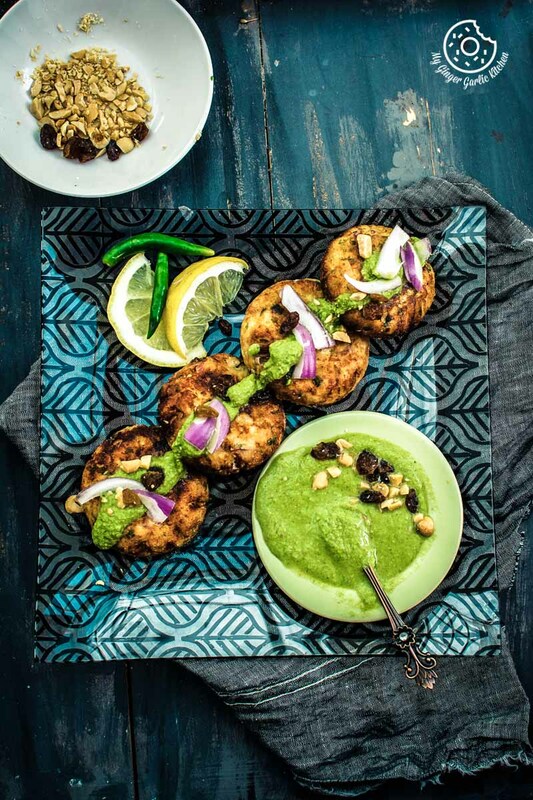 Are you excited to try this naan? 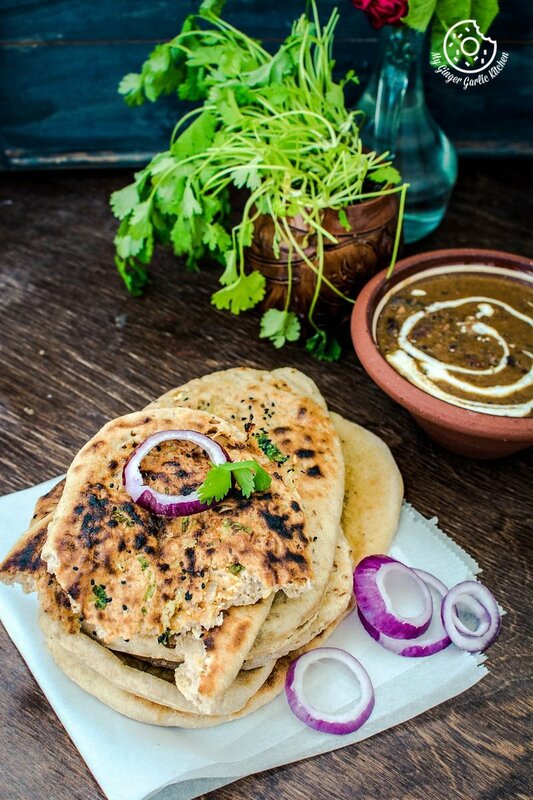 Then you can also try making an excellent Indian curry to go with this paneer naan. 1. In a small bowl, mix the yeast and sugar with one 1/4 cup of warm water. 2. Leave it in a warm place for 5-10 minutes or until the yeast is covered with froth. 3. Mix together activated yeast mixture, the flour, salt and 1 tbsp oil. 4. Add a little water and knead well with your hands to make a soft and slightly sticky dough. 5. Apply a little oil to the dough ball and cover it with a plastic wrap. 6. Leave it in a warm place to rise for 2 hours or until it is double in size. 7. Punch the dough and knead again. 8. Pinch a large lemon size balls and dip it into dry flour. 10. Repeat the same method with the rest of the dough. 1. Add all the ingredients of stuffing in a bowl and mix well to combine. 1. Take one dough portion/ball and roll to 2-inch circle with a rolling-pin. 2. Place a 2 tbsp of paneer stuffing on the center. 3. Bring together all the sides in the center and seal tightly. 4. Press lightly to seal the edges well. 5. Top with some nigella seeds and chopped coriander. 6. Dust with dry flour and roll the stuffed dough ball into an oval shape. 7. Make sure the stuffing should not come out. 8. Don’t roll them out too thinly or they’ll turn out like crisps. 9. Heat a pan over medium-high heat. 10. Apply water on one side of naan and place the water side down on the tawa/pan. 11. Cook for about one minute, until the dough, puffs up. 12. Once the naan start bubbling and dough start drying, flip the tawa over the hot plate or flame and cook for one more minute or until they turn golden brown. 13. Brush the cooked naan with melted garlic ghee or butter. 14. Cover with a cloth to keep warm until serving. Garlic Tawa Naan is ready.